Not to be confused with World 3-8. Stage 3-8 is the eighth and final level of the Ship in Donkey Kong. The stage is the final boss fight with Donkey Kong on the ship. 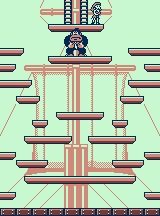 There are very many platforms for Mario to jump on to reach Donkey Kong. On the bottom there are two platforms on each side Mario can jump on easily to get up to the middle platform which leads to four more platforms on both sides for Mario to jump on which leads to even more platforms on each sides with a platform in the middle. There are four more platforms on both sides higher than the middle platform then there's Donkey Kong on a platform in the middle with Pauline on a platform above him. The battle is the same as the last two: the player must grab the Barrel, reach Donkey Kong and throw it at him three times. Donkey Kong's attack pattern is the same as before: he can roll barrels, throw barrels to the sides, and throw barrels straight down, except this time the barrels move more wildly due to the layout of the platforms. There are also no walls, so the barrels that continue rolling roll off-screen. Once Donkey Kong is defeated, the level ends, but Donkey Kong gets back up, grabs Pauline and runs away. The Ship stops by two rocks and a cliff, and Donkey Kong jumps on the two rocks across the gap and onto the ledge, then puts Pauline down and jumps around while grinning. Mario pauses, then does a Handstand onto the first rock, then Handstand Jumps off the first one onto the second rock, then Handstand Double Jumps off the second one onto the cliff. Donkey Kong, shocked by this, grabs Pauline and runs into the Jungle with Mario still giving chase. The cutscene then ends and the player is given lives based on their score. This page was last edited on December 31, 2017, at 20:14.